Mark Hara, a fourth-generation Japanese American, sees himself as an up-and-coming community leader, a process that has been years in the making from his experiences with Kizuna and the community. Through these experiences he has built his networks in the community, developed various leadership skills, and moreover, been empowered as an individual and as a leader. 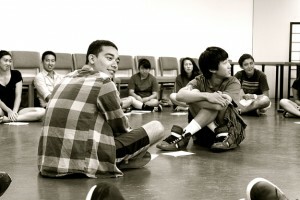 Mark, in his fourth year at the University of California, Irvine, is currently acting as a lead supervisor in Kizuna’s upcoming Youth CAN program, where he manages both high school and college students as they develop community services projects for Japanese American community-based organizations. “I really believe this program is critical to the future development of leaders in our community. By being a supervisor for Youth CAN, I am able to mentor high school students and develop their experiences in this community while also exercising my own skills in leadership. Seeing their enthusiasm and excitement to be involved is what drives me to work hard in this community.” Hara said. The Youth CAN program is one of several programs that Kizuna has kicked off within its first year of operation. Kizuna is in the process of building a spectrum of opportunities for leaders of all ages. Individually, each program provides workshops, activities and community service that specifically cater to the targeted age demographic. As a whole, these programs form a larger pipeline that create a path of involvement for people who want to be involved in the Japanese American community. One year ago, in April 2011, several young leaders came together with the vision of creating a space where there would be an abundance of opportunities for those interested, and where a next generation of community activists could feel empowered to be involved. “Before Kizuna there weren’t really a lot of opportunities to be involved in this community beyond the usual volunteer requests. Youth CAN, among many of Kizuna’s programs, is a great step in the right direction. I’m really happy at how much this program has grown in the past year and hope that more students join in the future. The Japanese American community is forever changing as it becomes more multicultural, so programs like Youth CAN are important in building a vibrant Japanese American community,” Hara said. Workshops like Kizuna’s “Ideal Little Tokyo” help students to brainstorm, envision and discuss how they would like their community to look in the future. Over the course of this past year, Kizuna has partnered with a number of organizations and developed several critical programs that have drastically increased the number of opportunities available for youth in the Nikkei community. 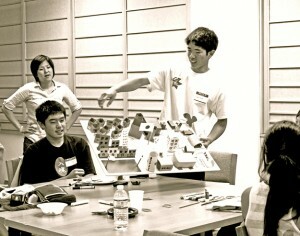 As of July 2012, Kizuna had already partnered on and independently developed five core programs for youth. Through these programs, the organization has worked with over 175 youth in just a single year. The Youth CAN program was one of these initiatives targeted at high school and select college students. “This program fits two critical needs. While my sister is involved in the high school track of this program and is learning about the community, as part of the college track, I am supervising projects, developing management skills and learning how to lead projects that will have an direct impact on our community,” Hara said. The Youth CAN program was strategically designed to fit together in a larger pipeline of opportunities for various ages of youth. Craig Ishii, Kizuna’s executive director, described how each of Kizuna’s current programs provide targeted opportunities for different category ages of youth, including: middle school (6th-8th), high school (9th-12th), college and young adult. Ishii explained how Kizuna is already in a number of collaborative efforts including the Camp Musubi culture and heritage camp program for middle school students, the Bridging Communities civil rights program for Japanese and Muslim American high school students, and the Nikkei Community Internship program for college students. Additionally, he discussed the organization’s research into new areas where programming had not yet been developed. The Youth CAN program is one of many designed to create a sense of passion and engagement from young Nikkei. It is one of several programs that Kizuna has launched its first year of operation. Ishii described at length the amount of volunteer, board and staff effort that was needed to build Kizuna in its first year. For their next phase, Kizuna now looks toward completing their pipeline initiative in the years to come. Board Chair Mickie Okamoto describes the organization’s plans to explore new areas of programming for youth in kindergarten through 6th grade as well as relevant programming for young adults, while eventually looking towards adding more family-oriented activities. “Wouldn’t it be great if our kids, and their kids all had an opportunity to participate in community activities on a more consistent basis? I think the existing programs are great but we would love to strengthen the community ties by creating more consistent youth/family oriented activities. The existing basketball leagues are a perfect example of the ties that can be built. We hope to create more unifying opportunities to the future generations and beyond,” she said. Kizuna encourages the community to continue to keep a close eye on its programs and activities. “It’s amazing how far we have come in the last year. Our first fundraiser, Family Showdown, was the epitome of what our goals are. Having a group of 250 guests ranging from toddlers to grandparents all laughing, thinking, participating–that’s what we have to offer. We hope to have the continued support of the community to reach our goal to secure a prosperous future for our community,” Okamoto said. For more information about Kizuna, visit www.kizuna-la.org or contact the organization at [email protected], or phone (213) 973-4465.